January 3, 2019 - San Francisco Components (SFC) has introduced a new educational component of its website to address Printed Circuit Board (PCB) component sourcing and overages. The information is geared to help customers source the right amount of critical components without creating costly shortages during PCB assembly. The component overages worksheet gives target quantities for projects based on the number of finished pieces required. The sheet is broken down by component size for common resistors and capacitors. SFC also offers a formula for more expensive parts for more accurate budgeting. "One of the most frequent questions we get from customers is how to know what is the right quantity of components that are needed for any given project," says Sam Danovich, VP of Sales. "Order too few, and you create delays or order too many and you’ve wasted money. Our years of experience has given us the knowledge to accurately walk customers through this process with a great degree of accuracy." 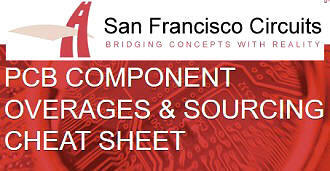 You may view the PCB component overages sheet at the San Francisco Circuits website. San Francisco Circuits is a leading provider of printed circuit board fabrication and assembly. Their specialty is in the complex, advanced technology of PCB fabrication, producing high quality multi-layered PCBs from elaborate layouts. With San Francisco Circuits and their partner network, customers gain the benefit of unparalleled technical expertise at competitive prices and the most progressive solutions available. San Francisco Circuits has locations in San Diego and headquarters in San Mateo, California.